Steel Roofing Systems Installation & Price Estimates in Ontario, Canada - Pro Roofing Inc.
Steel roofs resist punctures, shed snow, are durable, weather tight, heat / fire-resistant and environmentally-friendly. Under normal conditions, steel roofing panels resist chipping, cracking, peeling and perforating. Steel roofing systems carry a 50 years manufacturer's warranty against steel roofing materials defects and corrosion. A properly installed steel shingle roof may well be the last roof you ever have to install on your home. Steel roof innovations have virtually eliminated rust and corrosion worries. Their toughness meets the strictest codes for wind, fire, and impact. Galvanized steel roofing is also one of the most energy efficient roofing systems available, even meeting recyclability criteria. Because steel metal roofing is available in a wide array of designs, finishes, and colors, it is ideal for the most discriminating homeowner. Pro Roofing provides contemporary, traditional, or old-fashioned steel roofing styles. Roof steel is green material. Environmentally friendly and sustainable, green roofing materials offer energy efficiency, recyclability, and extremely low maintenance requirements. 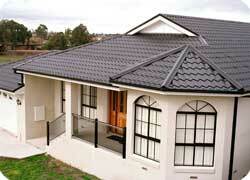 Steel tile roofing can save you money. Because steel is the most maintenance-free roofing material on the market, it saves money on upkeep and maintenance. Considering re-reroof expenditures, energy maintenance, insurance, resale, and taxes, steel roofing is an investment with a very fast payback. Steel roofing sheets reflect a high percentage of the sun's energy back into the atmosphere, lowering attic temperatures and subsequent cooling loads which make your roof more energy efficient. Painting residential steel roofing with high reflectance paint systems can save you up to 40% on cooling costs when compared to typical asphalt shingles. Residential steel roofs are available in two main profiles; shingles and standing-seam. Shingle steel roofing installation profiles resemble conventional asphalt shingles roofs, cedar shake tiles, and even a natural slate. Steel shingles are available in a variety of cool-roof rated colors and styles. Steel shingles feature a four way interlocking shingle design, which provides unsurpassed roofing system reliability. Such a roof can withstand hurricane winds up to 110 miles per hour. Coated with combination of zinc and aluminum alloy, steel roofing shingles are well protected against oxidation and rust. Painted with a high quality paint finish, steel shingle reflects solar radiant heat and keeps your building cool, which helps reduce cooling costs. or use an online form. Pro Roofing has done 2 complete roof replacements, and three major patches for my remodeling projects in the last several years. They are always quick, professional, clean and affordable – things I need in the type of work I do with my clients. They are very detailed in their estimating and there are no assumptions and guess work. Everything is laid out on paper, and you know exactly what you’re getting. One time additional work appeared, it was added to the contract and delivered as agreed. I don’t even get competing prices anymore because I am confident in them. Recommend them for other professionals/companies and for everyday homeowners.